It's 10:20 in Sunol, USA right now. 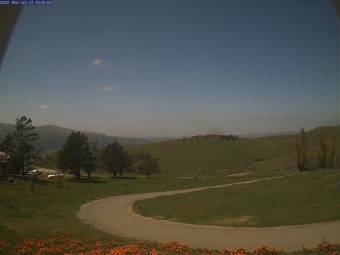 Weathercam A webcam in Sunol, California with image archive and current weather data. Pleasanton, California: Views from Grey Eagle, 4.8 miles away. Palo Alto, California: Sky above Palo Alto, 17.5 miles away. Sunnyvale, California: Webcam Sunnyvale, 17.6 miles away. Sunnyvale, California: Megapixel Webcam Sunnyvale, 17.6 miles away. Mountain View, California: WeatherCam Mountain View: Gemello Skies, 18 miles away. San Jose, California: View of the Skyline, 19 miles away. San Jose, California: Lick Observatory, 19 miles away. San Jose, California: Milpitas Christian School, 19 miles away.